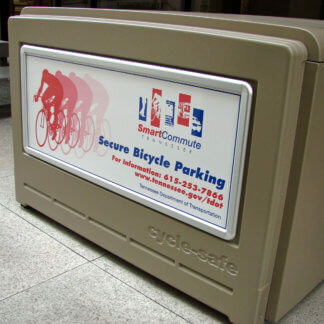 CycleSafe ProPark® View-Thru™ bike locker combines the Door-View door (11” x 11”) and Side-View side (23” x 60”) features shatterproof, weatherproof, polycarbonate panels that provide visibility into locker contents for security and locker availability. This model includes an interior clear polycarbonate partition which allows visibility through a full row of lockers. ProPark View-Thru Units are available as a stand alone bike locker or extended into rows with Adder Units. Each unit can accommodate one or two bikes and can be specified as a single sided door option for limited access.